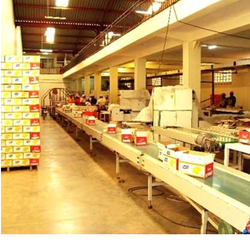 Our product range includes a wide range of belts conveyor for food packing. Backed by latest technology support, Belts Conveyor for Food Packing offered provides for superior conveyor belting support and feature flat smooth surfaces. Available with different textured top choices for meeting the conveying needs of applications needing extra grip, here our expertise lies in making these available in different shore hardness choices as well as with customized fabrication support as demanded by the customers. Featuring one piece extrusion, these conveyors are developed using superior material support to provide suitability in food applications. Some of its benefits include offering easy cleaning support, smooth performance that lowers overall conveying costs, offering ease of welding endless, ensuring lower bacteria counts, meeting international hygiene standards for food contact materials and others.